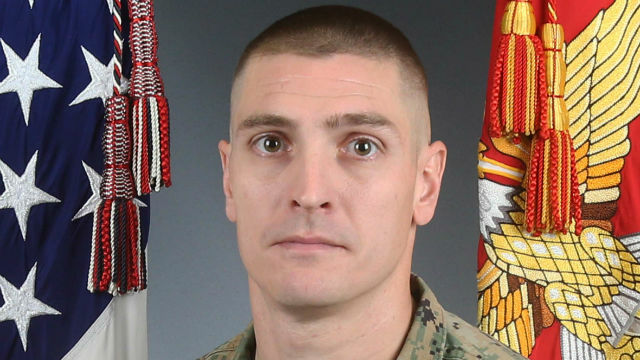 The remains of a 33-year-old Marine killed last week along with three fellow Miramar-based servicemen in a helicopter crash in Imperial County will arrive in San Diego Saturday in preparation for funeral services. Gunnery Sgt. Derik R. Holley of Dayton, Ohio, and his crewmates were taking part in training exercises near El Centro when the CH-53E Super Stallion they were aboard went down for unknown reasons on the afternoon of April 3. The cause of the crash is under investigation. Holley’s body will arrive at San Diego International Airport late this afternoon, then be transported via a military procession to a Mountain View- area mortuary, according to Laura Herzog, executive director of Honoring Our Fallen, a support group for families of military casualties. Also killed in the accident were Lance Cpl. Taylor J. Conrad of Baton Rouge, Louisiana; 1st Lt. Samuel D. Phillips of Pinehurst, North Carolina; and Capt. Samuel A. Schultz of Huntington Valley, Pennsylvania. The personnel, with Marine Heavy Helicopter Squadron 465, Marine Aircraft Group 16, 3rd Marine Aircraft Wing, had flown to the remote desert area from the Marine Corps Air Ground Combat Center at Twentynine Palms to practice making landings in unimproved terrain, according to USMC officials. Holley enlisted in the Marines in November 2003 and deployed to Iraq twice in support of Operation Iraqi Freedom, to Japan as part of the Unit Deployment Program and with the 15th Marine Expeditionary Unit. During his service, he received a Navy and Marine Corps Commendation Medal, Navy and Marine Corps Achievement Medal, Air Medal-Strike/Flight, and Navy and Marine Corps Good Conduct Medal. A ceremonial memorial service for Holley is scheduled for Tuesday at Marine Corps Air Station Miramar, Herzog said.